Simple yet pretty, ideal for tea-time or a party. Preheat the oven to 180C/gas mark 4. Place paper cases in a 12 hole muffin tin. Beat the butter and sugar together until light and creamy. Add the milk and eggs gradually, beating well. Sift in the flour and baking powder and beat well. Spoon the mixture into the paper cases and bake for 20 minutes, until golden. Leave to cool in the tin for 10 minutes before transferring to a wire rack to cool completely. In a bowl, beat the butter, milk, vanilla extract and half the icing sugar until smooth. Gradually add the remaining icing sugar and beat again until the buttercream is smooth and creamy. Spread the buttercream evenly over the 12 cupcakes. Knead the pink fondant until pliable, then roll out on a surface lightly dusted with icing sugar, to about 3mm thick. Using a round cutter the same size as the top of the cupcakes, cut out 12 circles. Place the circles, pressing down slightly, on top of the cupcakes that you have spread the buttercream on. Knead the yellow fondant until pliable, then roll out as you did the pink fondant. 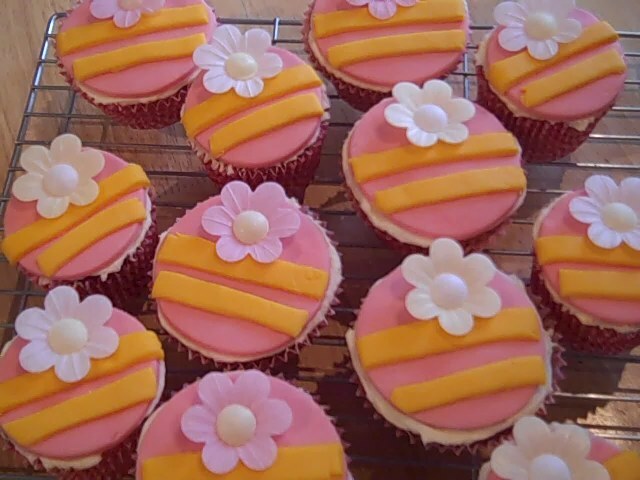 Cut 1cm wide strips, long enough to fit across the top of the cup cakes, brush with water and put in place, one across the middle of the cupcake and one slightly lower. Gently push in the wafer flowers in the upper part of the pink fondant. Tip: if like me, you already have white fondant you can colour it yourself with food safe colouring. You can also change the colours to suit your party theme.